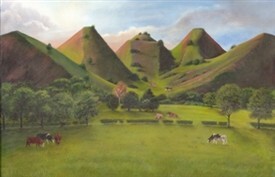 Painting of the Five Sisters shale bings. The proper name of this bing is Westwood Bing, formed from the spent shale from the Westwood Oil Works near West Calder. The Oil Works was set up during the Second World War to supply the wartime surge in demand for oil. The bings are about a mile northeast of Addiewell. They are now a protected industrial monument, and are a well-known landmark in West Lothian. Where the shale was dumped depended on which way the wind was blowing. That's why there are five bings. Coal bings were always next to coal mines. However, spent shale was not dumped until it had been processed at a crude oil works. So shale bings were always next to oil works, not mines. This page was added by Billy Kane on 24/06/2012.